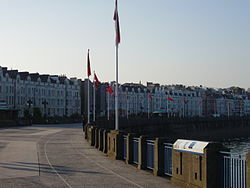 Douglas (Manx: Doolish) is the capital and largest town of the Isle of Man, with a population of 28,939 people (2011). It is located at the mouth of the River Douglas, and a sweeping bay of two miles. The River Douglas forms part of the town's harbour and main commercial port. Douglas was a small settlement until rapid growth occurred as a result of links with the English port of Liverpool in the 18th century. 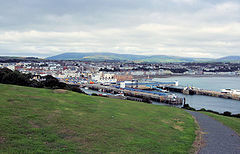 Further population growth came as the town industrialised in the following century, resulting in 1869 with the island's government, the Tynwald, relocating to Douglas from Castletown. The island's High Courts are also based in the capital. The town serves as the Island's main hub for business, finance, legal services, shipping, transport, shopping, and entertainment. The annual Isle of Man TT in motorcycle racing starts and finishes in Douglas. In the absence of any archaeological data, it is possible that the origins of the town may be revealed by analysis of the original street and plot pattern. The discovery of a bronze weapon in central Douglas, and the large Ballaquayle Viking treasure hoard on the outskirts, both in the 1890s, hint at the early importance of the site now occupied by Douglas. Scholars agree that the name of the town derives from Early Celtic 'Duboglassio' meaning 'black river'. Douglas is twice referred to in the Monastic 'Chronicle of the Kings of Man and the Isles'; first in 1192, when the monks of St Mary's Abbey at Rushen, were transferred there for a four-year stay, then again in 1313, when Robert (Bruce), King of Scotland, spent the night at the 'monastery of Duglas' on his way to seize Castle Rushen. These may be references to the site of the later Nunnery, a little upstream from the port. The first detailed documentation shows that in 1511 there were only thirteen resident households in the settlement clustered north of the harbour, most of the property there classifying as "chambers" (unoccupied, unheated, single-celled structures) for which rent was paid by non-residents including clergy, officials and landowners from elsewhere on the Island. This suggests that the origins of the town's nucleus were as a non-urban port. Current speculation links the store-buildings with the Irish Sea Herring fishery, and the import/export trade. In 1681 Thomas Denton described Douglas as "The place of greatest resort" on the Isle of Man, and by 1705 a clear picture of the early town emerges, with hints that its residential, market, and military defence functions were growing in importance alongside the port facility. The ensuing sixty years saw the town thrive as imposing merchants' houses, large warehouses, quays and a pier were provided to accommodate the burgeoning 'Running Trade' (smuggling) : one of the stimuli for the town to expand. Other forms of trade also grew, and following the Revestment Act of 1765, Douglas began to reap the benefits of trans-Atlantic trade, due to the discovery of the New World, and co-operation on a local level with Liverpool. Legitimate merchants who rose to prominence over the period included the Murreys, the Moores, and the Bacons. The town's later prosperity was facilitated by the low cost of living, and favourable legal status enjoyed by English debtors and half pay officers. The initial growth and development of the town owed much to its natural harbour (now the Inner Harbour), since greatly expanded and improved. Over the course of the 18th century, the town's population rose significantly, from 800 (approx.) in 1710 to nearly 2,500 in 1784. Throughout the nineteenth century, the town's demographics began to follow the same trends as the United Kingdom, due to the Industrial Revolution. The growing number of people wanting to holiday in the area, from the early nineteenth century, forged a new industry, and from around 1870 onwards, the town was transformed into a leading holiday resort. Juxtaposed with this prosperity were the increasingly unsanitary conditions, and poor quality housing; this, again, reflected a trend seen across the United Kingdom. The open sewage, middens (domestic waste dump), and smell from the harbour at low tide all contributed to the town's uncleanliness. Oil and gas lamps first appeared in late 1820s and 1830s, the first hospital to join the Dispensary was built in 1850, and Douglas bay became home to one of the town's most iconic pieces of scenery in 1832, when the Tower of Refuge was built to offer shelter and provisions for sailors awaiting rescue. Douglas, in the first half of the nineteenth century though, was often characterized by the destitution of its population and the high number of epidemics, in particular, cholera, that they suffered from. The rise of Douglas as the social and economic stronghold of the Isle was recognised in 1869, when it became the home of the island's government, the Tynwald, and therefore the capital, an honour previously held by Castletown, a smaller town in the south of the Island. Douglas's political landscape also changed significantly in the nineteenth century, in spite of the conservatism shown by some townsfolk: in 1844 for example, at a public meeting, the idea of a town council was rejected in favour of retaining the system of Town High Bailiffs (when the Town Bill Act was passed at Tynwald in 1852, the people of Douglas again rejected the idea). However, an act passed later that decade, which did not include opt-out clauses, was accepted, and in 1860, Douglas elected its first town council, which was predominantly middle class in its makeup. The Town Commissioners were able to tackle the town's problems with greater efficiency, and by 1869, the sewage problem had been largely taken care of. The Commissioners also designed to alter the anachronistic architecture of Douglas, built during the era of fishing and trading, and no longer amenable or safe for tourists. The proportion of the Manx population living in Douglas was also expanding, with 35% living there by 1891. The Victorian and later modernisation of the town was achieved at the expense of the original maze-like layout of the oldest streets. These were cleared away in the new street schemes and slum clearances of the 1870s to 1920s. 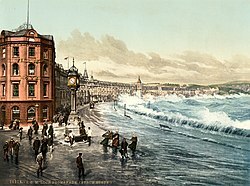 The town's infrastructure was radically altered in order to convenience tourists, and in 1878, the Loch Promenade was constructed. In 1870, there were 60,000 visitors annually, by 1884, this had grown to 182,000. In 1887, 310,916 visited for Queen Victoria's Golden Jubilee. During World War I and World War II, Douglas and other parts of the Isle of Man were home to internment camps for 'enemy aliens'. Douglas held seven out of the ten Manx internment camps during World War II, including: Hutchinson, Metropole, Central, Palace, Granville and Sefton Camp. Sections of the Promenade were cordoned off and many guest houses were used for the purpose. 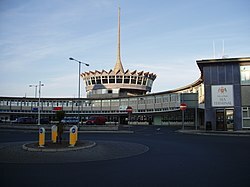 Douglas is now home to the Island's offshore financial services industry, and main shopping centre. The town was the birthplace of the Gibb brothers, Maurice, Robin, both deceased, and Barry, the members of the 1970s disco band The Bee Gees. Douglas was home to the Summerland leisure centre. In 2011 Douglas hosted the Commonwealth Youth Games. Douglas is situated on the east of the island near the confluence point of two rivers, the Dhoo and the Glass. At Douglas, the rivers flow through the quay and into Douglas Bay. A gently sloping valley runs inland. Hills lie to the north-west and south-east. The town is surrounded by several other smaller towns and villages, most notably Onchan to the north (which forms a conurbation with Douglas) and Union Mills to the west. The Isle of Man census 2011 lists the population of Douglas as 27,938, increased from a population of 25,347 in 2001. The town has 33.06% of the island's total population of 84,497. References to education in Douglas begin in the late seventeenth century, with mention of the schoolmastership, usually combined with the Chaplaincy of Douglas, and reference to a "petty school" in 1675. William Walker (1679–1729) was appointed to the mastership in 1700, school being probably kept in the old Chapel, (in later Heywood Place.) Later being promoted Rector of Ballaugh, and the recipient of an honorary Doctorate, Walker is now remembered in his mother's Manx Gaelic lament on her sons: "Illiam Walker as Robin Tear". The more formal history of education in the town begins with Bishop Thomas Wilson's establishment of the Douglas Grammar School. Alderman William Dixon (a native of Douglas, but resident in Dublin since at least the 1680s) agreed to hand over his parent's former home, and passed over the New Bond Street property in 1714. The Bishop raised an endowment of £500 (Irish currency), half being funded by the Barrow Trustees, most of the balance being provided by the Bishop's Douglas relatives, the Murrey family. Even after this, the mastership of Douglas Grammar School continued to be combined with the Chaplaincy, now of the new Chapel of St Matthew. Details of the building of the original Grammar School are sparse, but it seems that William Murrey was deeply involved, retaining the use of the capacious storage vault under the school in lieu of repayment of £150 costs. Another notable Master of the Grammar School was Rev. Philip Moore (1705–1783) who was a native of the town, his father Robert Moore having been one of the "Undertakers" who organised the construction of St Matthews, and his mother Miss Katherine Kelly. Moore was appointed Master in 1735, and was reckoned to be a good classical scholar, and have "an inherent love of teaching". Today, Douglas is home to two high schools; Ballakermeen High School and St. Ninian's High School and numerous primary schools. Isle of Man College and the International Business School are also located in Douglas. A horse tram passes a pedestrian crossing. Douglas, Isle Of Man. The Tower of Refuge is a small castle-like shelter built upon Conister Rock in Douglas Bay as a sanctuary for shipwrecked sailors. Construction was instigated by Sir William Hillary, founder of the RNLI. Douglas Head is home to the Grand Union Camera Obscura which has recently undergone restoration and is open to the public during the summer months. Other artefacts and remnants of Victorian Tourism can still be found on walks around the area. The horse-drawn trams that run along the promenade from the Sea Terminal to the Manx Electric Railway station from spring to early autumn. Steam trains run 15 miles from Douglas railway station to Port Erin in the south of the Island. The Grandstand on Glencrutchery Road marks the start and finish of the annual TT Races and various other motorsports. Victoria Road Prison was the first purpose-built prison in the Isle of Man. Opened in 1891, the prison closed in 2008. The Gaiety Theatre and the Villa Marina are popular venues for all manner of stage acts - from rock music to comedy to drama to ballet. The Gaiety Theatre is one of the best surviving examples of the work of Frank Matcham and dates from 1900. Both venues have recently undergone extensive renovations. The award-winning Manx Museum in Kingswood Grove is a treasure house which contains many of the most important cultural artefacts relating to the Manx nation. Some of the highlights include the Calf of Man Crucifixion Stone, the Pagan Lady's necklace from the Viking excavations at Peel Castle, and the largest collection of Archibald Knox materials. It also houses the National Art Collection, and the National Archives. Other buildings of interest include Isola restaurant, in John Street, and the Douglas Hotel, on the North Quay, both merchants' houses from the mid-eighteenth century; The Castle Mona (formerly the Quality Hotel), a magnificent seaside mansion built by John Murray, 4th Duke of Atholl in 1804, currently awaiting refurbishment; and the Loch Promenade, a magnificent curving terrace of former boarding houses dating from the 1870s. Douglas is becoming increasingly renowned as it saw the first architectural essays of the Arts and Crafts architect Baillie Scott. The Sunken Gardens on Loch Promenade were created as a result of the widening of the promenade at the turn of the twentieth century. A construction line was installed for this task. The National Sports Centre (NSC), a large multi-sports centre and athletics stadium is located on Pulrose Road. The NSC is owned by the Department of Tourism and Leisure of the Isle of Man Government and operated by the Manx Sport & Recreation. The King George V Bowl, multi-use stadium is located on Pulrose Road. It is owned by Douglas Borough Council. Douglas is also the start and finish point for the Isle of Man TT which is the biggest classic roadracing event in the world. The race has been a part of the FIM Motorcycle Grand Prix World Championship but is not a part of the series due to the track's safety record and because the track is situated on public roads. Corinthians A.F.C. Who play their home games at Nobles Park. Douglas and District F.C. Who play their home games at Groves Road, Pulrose. Douglas Royal F.C. Who play their home games at the National Sports Centre, Groves Road. Gymnasium F.C. Who play their home games at Tromode Park, Tromode Road. Police A.F.C. Who play their home games at Groves Road, Pulrose which they share with Pulrose United. Pulrose United A.F.C. Who play their home games at Groves Road, Pulrose. St Georges A.F.C. Who play their home games at Glencrutchery Road. St Marys A.F.C. Who play their home games at The Bowl, Pulrose Road. A panorama of Douglas bay looking out to the sea. ^ Crowe, N.G. (2001). Survey of Douglas. 1. p. xvi. ^ Gardiner, Mark & others; 'Continental trade and non-urban ports in mid-Anglo-Saxon England : excavations at Sandtun, West Hythe, Kent'. Archaeological Journal, 158 (2001), 161-290. ISSN 00665983. ^ Crowe, N.G. (2001). Survey of Douglas. 1. ^ Moore, A.W. (1900). History of the Isle of Man. London: T. Fisher Unwin. p. 436. http://www.isle-of-man.com/manxnotebook/fulltext/hist1900/ch32_3.htm. Retrieved 7 September 2013. ^ a b c d e f Gordon N. Kniveton; Robert E. Forster, B.A. ; Robert Kelly; Stuart Slack; Frank Cowin F.R.I.C.S. (1996). Douglas Centenary 1896-1996. Manx Experience. ISBN 978-1873120217. ^ Belchem, J., 2000, 'The Onset of Modernity' in A New History of the Isle of Man, Vol V, Liverpool U.P. ; ISBN 0-85323-726-3. ^ Clive Behagg (1991-10-03). "5: The Development of the Labour Party 1885–1902". Labour and Reform: Working Class Movements, 1815-1914 (Access to History). Hodder & Stoughton. pp. 99–103. ISBN 0-340-52930-X. ^ "Tower of Refuge". IOM Guide. http://www.iomguide.com/towerrefuge.php. Retrieved 2008-10-04. ^ "Isle of Man Census 2011 Summary Results" (PDF). Economic Affairs Division, Isle of Man Treasury. 2011. pp. 3. http://www.gov.im/lib/docs/treasury/economic/census/isleofmancensusreport2006.pdf. Retrieved 2008-09-28. ^ Rev. Hinton Bird. An Island that Led, The History of Manx Education. I. p. 75. ISBN 978-0951691809. ^ A.W. Moore (1901). Manx Worthies. p. 22. ^ N.G. Crowe (2001). Survey of Douglas. I. p. xiii. ^ A.W. Moore (1901). Manx Worthies. p. 101. ^ N.G. Crowe (2001). Survey of Douglas. I. p. 9. ^ McHutchin, J.; Quirk, G. (831). The Isle of Man Charities. Liverpool. p. 112. ^ Isle of Man Leagues: The Canada Life Premier League, The Football Association. Retrieved 2013-03-14. This page uses content from the English language Wikipedia. The original content was at Douglas, Isle of Man. The list of authors can be seen in the page history. As with this Familypedia wiki, the content of Wikipedia is available under the Creative Commons License.